In our co-​design work we found that often information flows in only one direction, away from engagement activities (and practitioners) and into other parts of organisations. 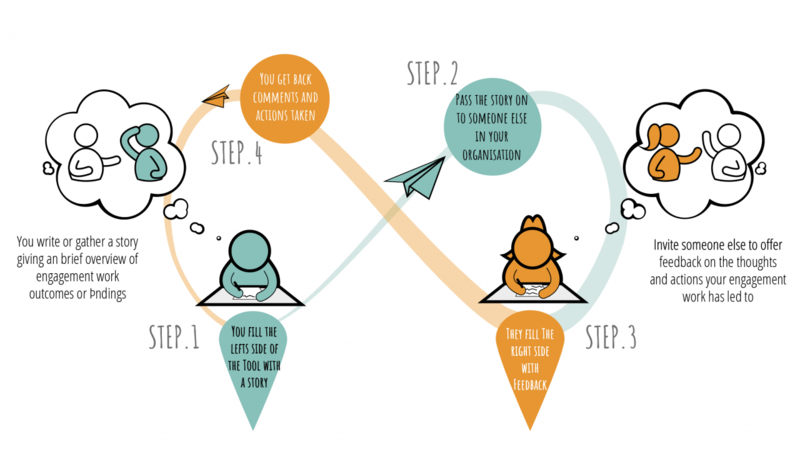 This tool offers a direct way to change this by giving you a way to personally invite a colleague, manager or decision maker to feed back on stories drawn from engagement activities. If you allow it, will only use this email address to contact you regarding this tool. We won’t pass your details on to anyone else, and you can opt out of contact at any time. Thank you for your interest in our tool. Our tools are free for anybody to download and use. The tools are experimental, and we are still researching how well they enable all sorts of collaboration. In return for downloading a Leapfrog tool, we would like to ask your permission to keep in touch. We’d love to know how you plan to use the tool and who with. Further down the line, we’re keen to hear how it went with the people you worked with. Did the tool help or hinder? Did you adapt it? Your responses will inform our research and help us to see how the tools are being used in different ways and contexts. We would like to contact you to find out how you’ve used this tool. We won’t share your details, and we won’t contact you more than once unless you want us to. If we already have your details, we won’t contact you extra times. In the next few days one of the Leapfrog team will contact you using your preferred method to ask some brief questions about how you plan to use your tool. With your permission we will contact you again in about 6 weeks and then again in 8 months to get feedback. We also welcome comments and photos of how you have used your tools on our Facebook group, a community of Super Tools Users who can learn from one another, or you can Tweet us too. We look forward to getting to know you. We will only use your details to contact you regarding this tool. We won't pass your details onto anyone else, and you can opt out of contact any time. Frogs can be a bit scary.